The district of Venice known as Santa Croce is famous as one of the most sought after parts of the city because of its beautiful architecture, local feel and lively atmosphere. It is also ideal placed, situated as it is nestled between the city's main Piazzale Roma and the Rialto Bridge and yet still near the Santa Lucia Railway Station and within walking distance of St Mark's Square. The area is within the curve of the Grand Canal and the Hotel Basilea Venice is also situated right on the Rio Marin Canal (known as the Canal of Serenades), from which you can hop onto a gondola to take the most famous Venetian form of travel. For the more modern minded however, the proximity of the Hotel Basilea to the railway station and Piazzale Roma mean that they are within easy reach of the main transport hubs of Vencie. 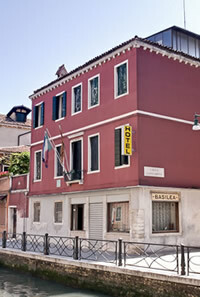 Whatever your reason for visiting Venice, you will find the Hotel Basilea perfectly located to see and do all you wish in the center of Venice and beyond, and our fabulous 3 star facilities and rooms mean that you can retreat in style to our welcoming hotel to recuperate and reflect on what will no doubt be a unique and amazing experience of our floating city. All of Venice's most beautiful sights and places of cultural significance are within easy reach from Hotel Basilea, but the immediate area itself can boast beautiful squares such as Campo San Giacomo dell'Orio and other typically Venetian spots. There are some lovely places to eat in the vicinity and the area hosts a mix of local shops and restaurants.